Bull Thistle is a member of the Sunflower Family. It grows to 4 feet in height and has dark green, lance shaped, spiny leaves leaves which clasp the stem of the plant and grow to 6 inches in length. The plant grows along road sides and in fields. Bull Thistle is not native to Arizona and is considered a weed. 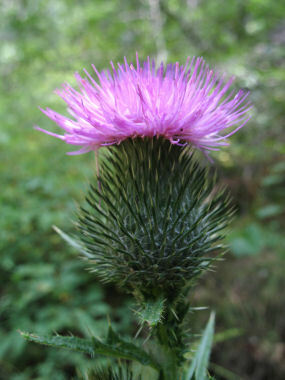 Bull Thistle blooms between June - September and produces purple to pink flowers to 2 inches in width. Flowers are follwed by "thistledown" - small seeds with covered with fluff. This type of seed is called an "achene." The Bull Thistle is a biennial plant, which means it lives for two years and then dies. The first year it grows a rosette, a cluster of leaves near the ground. The second year it grows flowers and fruits, spreading seeds before it dies.